Beach day tea - Monsieur T.
Drink against an acute winter sickness or during a beautiful summer day. In any case, a flower necklace is required. Get your flip flops ready. A day at the beach cup gets you southbound in first class. Equally good hot as it is iced, the slightly tart cherry taste blends perfectly with ripe pineapple. A hint of lemongrass brings just the right amount of spice to this green tea blend, scented with sunflower blossom. 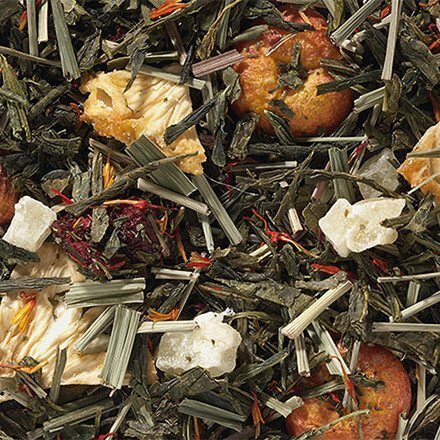 Contains: Chinese Sencha green tea, lemongrass, pineapple cubes and flakes, flavors, dried acerola cherries, dried cherries, safflower flowers.